It has been a pretty warm winter here near the Puget Sound and from what I read, it will likely continue that way. 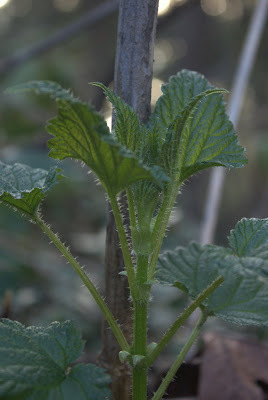 Last week I picked my first batch of nettles (Urtica dioica), some of them were already nearly a foot tall. I have seen house flies buzzing around for the first time in what seems like a few months. Indian plum is well on its way to being leafed out. I'm not sure if it is related to spring or not (seems like it might be), but my cat caught and ate two mice (or at least that is how many he brought in to the house) after having had a pretty dry spell for the last couple of months. It's an exciting time of year. I will be headed on a trip south for a couple of weeks and when I get back it will be time to start putting in some work on the garden!